Nationally, the number of U.S. students studying abroad for credit during the 2016-2017 academic year grew 2.3 percent from 325,339 students to 332,727 students. This represents about 1.6 percent of all U.S. students enrolled at institutions of higher education in the United States and about 10 percent of U.S. graduates. A recent survey found that almost 40% of companies surveyed missed international business opportunities because of a lack of internationally competent personnel. When 95% of consumers live outside of the United States, we cannot afford to ignore this essential aspect of higher education. 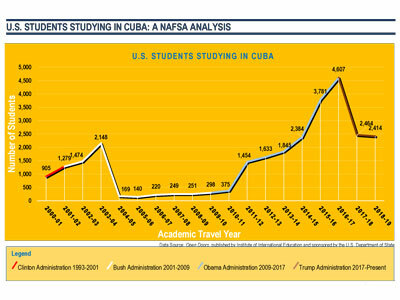 NAFSA has long advocated for policies such as the Senator Paul Simon Study Abroad Program Act to expand the total number of U.S. students studying abroad, and increase the diversity of study abroad students to more closely match the undergraduate population, and encourage study in nontraditional locations. The decentralized nature of U.S. higher education allows for considerable variance in study abroad participation from institution to institution and from state to state. NAFSA’s breakdown of study abroad enrollment by state lets institutions and state leaders gauge how they compare with national trends. Although the diversity of study abroad participation has increased in recent years, minority students are still greatly underrepresented in study abroad. An overwhelming majority of U.S. study abroad takes place in Europe with 40 percent of students studying in just five countries, the United Kingdom, Italy, Spain, France, and Germany. The information in the charts above is based on the most current data from the Institute of International Education's Open Doors Report and the U.S. Department of Education's National Center for Education Statistics.